Nickelback have released the lead and title track from their new album, Feed the Machine. Best Acoustic Rock Song of All Time Poll: "Patience" Vs. "Photograph"
We're out to crown the most beloved Acoustic Rock Song of All Time and we need your help! Today "Patience" and "Photograph" go head-to-head. Vote now! Back in January, the Black Keys made tabloid-style headlines everywhere after drummer Patrick Carney singled the band out in a Rolling Stone interview as the cause of the death of rock and roll. Nickelback are currently streaming their new album, Here and Now, exclusively on iTunes. Now that the Lions have a winning record again, their fans have to find more to complain about that just Matt Stafford's iffy durability. 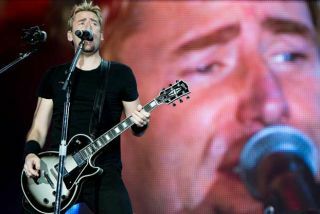 Nickelback are currently streaming two new songs, "When We Stand Together" and "Bottoms Up," on their official website.